On July 6, KBS2 released a few stills from the first script reading, which took place on June 29, for their upcoming time-slip drama “Manhole,” which will air on August 9 after “Queen for 7 Days” ends its run. The main cast, which consists of UEE, JYJ’s Kim Jaejoong, B1A4’s Baro, and Jung Hye Sung, came together along with the rest of the cast as well as the director and screenwriter of the drama for the first script reading. “Manhole” is a comedic time-slip drama about a man named Bong Pil who accidentally goes back in time by falling into a manhole. Kim Jaejoong will be taking on the male lead role of Bong Pil, who is his neighborhood’s token unemployed person. He goes back in time by falling into a manhole and attempts to stop the marriage of his long-time love Kang Soo Jin, who will be played by UEE. B1A4’s Baro will be taking on the role of Jo Suk Tae, a cute character who always loses to Bong Pil and is waiting for the right moment to exact revenge on Bong Pil. Jung Hye Sung will be taking on the role of Jin Sook, a character who has grown up in the same neighborhood as Bong Pil and Kang Soo Jin since they were young. [PARTIAL TRANS 1] Comedic acting extravaganza! 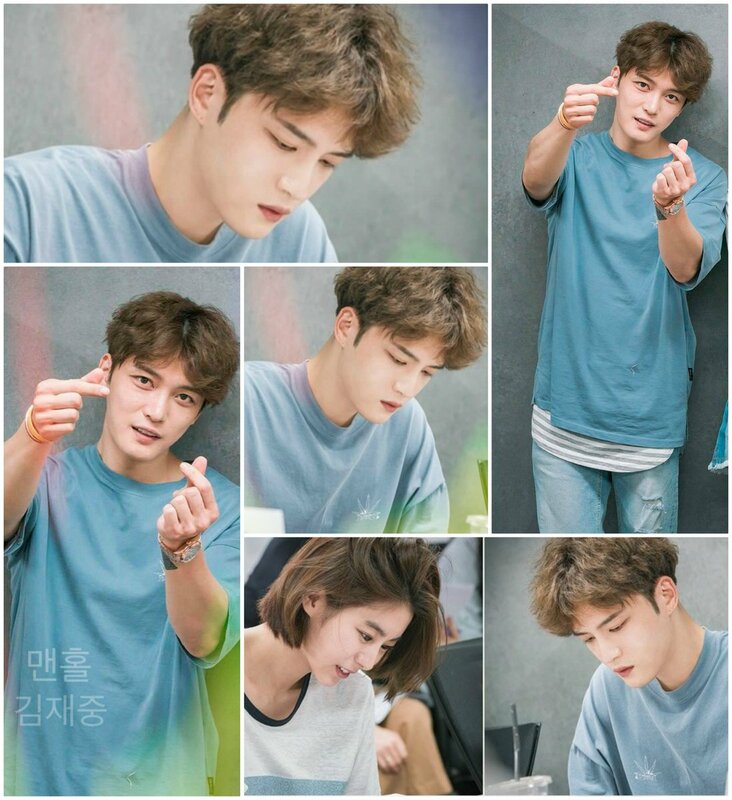 #Ready to see JaeJoong as ‘Bong Pil’ every #Wednesday and #Thursday?? You can #bet its going to be #awesome! way to hype me up more! this sounds so good and i can’t wait for JJ to come back to dramaland! and, his ugly is my beautiful best~he just does not know how to look bad unlike all the squids around him, myself included! gosh JJ, come to me quickly! i wish weight WAS easier to control! @koreamom So do I, so do I, koreamom. JJ must be having a will of steel to be able to fast for more than a day if he so sets his mind. I believe he went back to his skinny teenage days in preparation for his role as a school boy. I also have the feeling that this “spontaneous” trip was not so spontaneous. All this riding, fishing, karting, games, etc., he was perhaps letting his hair down so as to relax and enter under the skin of his new carefree character of Bong Pil. Even those pimples he was showing off on his one cheek, may be we shall see them on Bong Pil’s.pimply teenage face. Kris – I always look for your own version of photos collages….thanks so much. Also to comment…I was VERY excited to read the Director of Manhole’s comments “I’ve never laughed so hard in a script reading” !!!!!! THAT would be so encouraging to the cast and makes me look forward to it even more. Anyway – thanks for the GREAT collection of photos. I am not sure who does them! I guess his character start with being an average guy then maybe he changes to win over the leading lady?